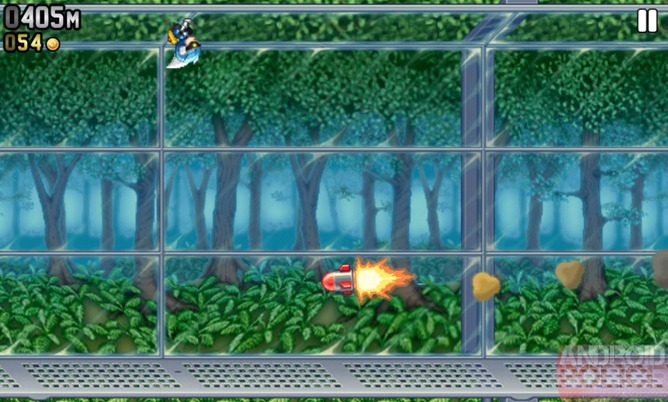 1 Machine Gun Jetpack - Need I Say More? The Rocketeer taught me three important lessons when I was a kid: Jennifer Connelly is smoking hot, Nazis are all evil, and the only thing cooler than a test pilot in pre-war Hollywood is a test pilot with a rocket pack stolen from Howard Hughes. 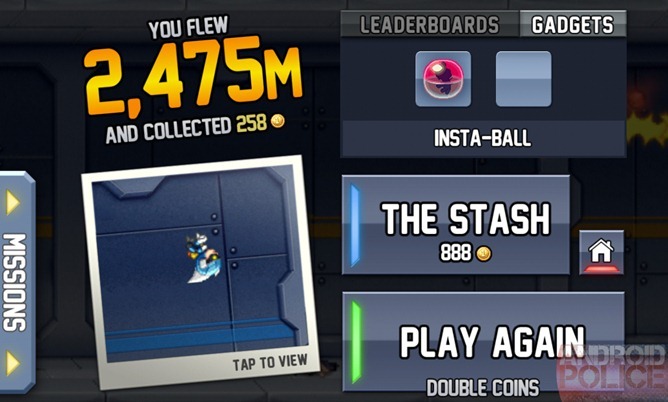 Along those lines, Halfbrick's Jetpack Joyride made quite a splash on iOS, and now it's available on Android as a free game supported by in-app purchases. For the moment it's available only on the Amazon Appstore, but Amazon will kindly give you a $1 credit to download the game. That alone should be enough to catch your attention, but there's a great game in there as well. 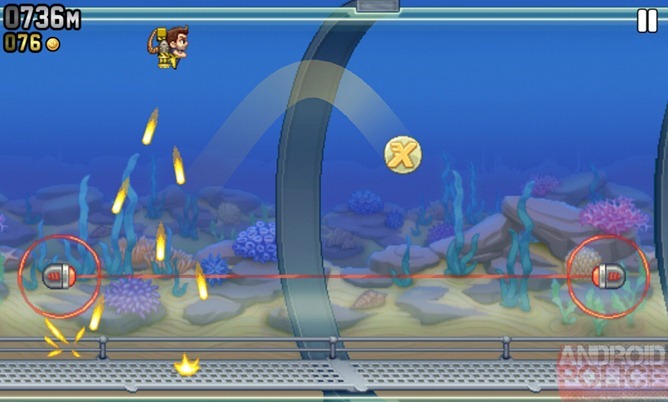 Machine Gun Jetpack - Need I Say More? Halfbrick's sleeveless hero Barry Steakfries, formerly the time-traveling shotgunner in the excellent Age of Zombies, returns to colorful 2D gaming. His motivation is simple: he sees an awesome jetpack which, for some reason, shoots machine guns downward as it zooms along. Your mission is to guide Barry as far as you can into the secret facility, collecting coins, dodging obstacles, and scaring the crap out of the mild-mannered scientists below him. Gameplay could not be simpler: tap and hold the screen to blast Barry up, release it to lower him to the ground. 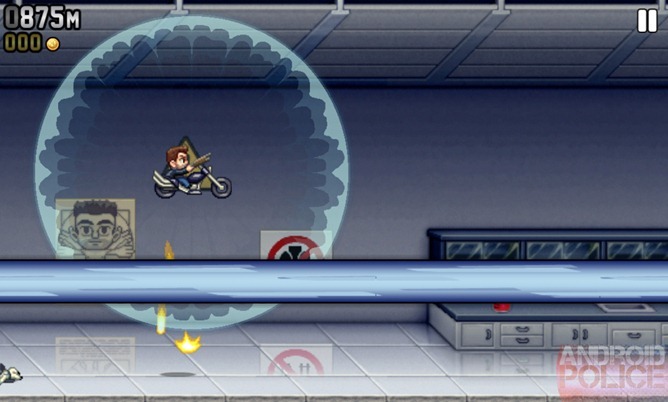 Barry runs constantly to advance the side-scrolling level, making Jetpack Joyride a one-touch experience perfect for quick games in a spare moment. Getting used to the ups and downs takes only a little practice - within a couple of runs you can weave Barry through the basics with ease. Aside from the scurrying scientists, there are three obstacles that can give Barry a mayday: stationary and rotating floating zappers, Bullet Bill-style missiles, and lasers that zoom in and give you a limited flight area. "You about to get Barry'd." None of them are particularly difficult on their own - the challenge comes when these obstacles are combined, as Barry increases his lateral speed the further he goes. Complicating things are the presence of static coins and power-ups (more on that later), and tokens which allow you to play a slot machine mini-game once you're inevitably knocked out of the sky. Since the rewards from this mini-game can often total or exceed the coins that you collect in a single run, it's well worth it to go after them, even when a rocker is staring you in the stubbled face. There's another curveball thrown into the gameplay in the form of vehicles. When you see a rainbow-colored box in the playing field, make every effort to grab it, because it grants access to a random vehicle for Barry to stomp around the laboratory in. 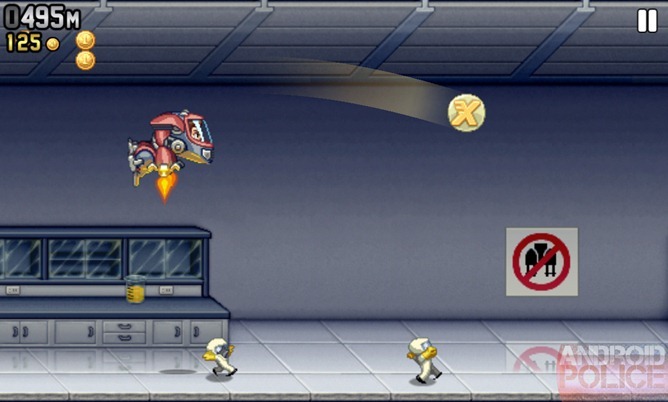 A rocket-powered motorcycle (the "Bad as Hog", complete with Barry's signature shotgun), a bird-shaped plane that poops cash (the Profit Bird, a not-so-subtle nod to Angry Birds), a tiny Mech Warrior (Lil Stomper), the Crazy Teleporter, a gravity suit, and an actual fire-breathing robot dragon named Mr. Cuddles all shift the game mechanics in subtle ways, making for an entertaining change of pace. "Wow, you're so much cooler than that stuffy old Falcor, Mr. Cuddles!" The Profit Bird will let you fly indefinitely, but Barry's physics are subtly changed. Hop in the Lil Stomper or the Bad as Hog and you'll need to jump over obstacles, with short bursts of levitation provided by jets on the mech. The Crazy Teleporter lets you gradually move in any direction, holding your vertical position (and teleporting through zappers as long as you're moving vertically). Cuddles the Dragon essentially controls in reverse, rising when you release your finger and lowering on a tap. The Gravity Suit is the most interesting (and difficult) of the bunch: tap once to reverse your personal gravity and run on the ceiling, then tap again to drop to the floor, dodging and collecting coins in a continuous run-fall. The vehicles also give Barry an extra level of protection, akin to Mario's mega-mushrooms. So despite the random nature of the drops, you'll want to grab one whenever possible. Upgrades to each vehicle and to Barry himself can be purchased with money earned in-game, though you can quickly boost your earnings with a little real-world dough. 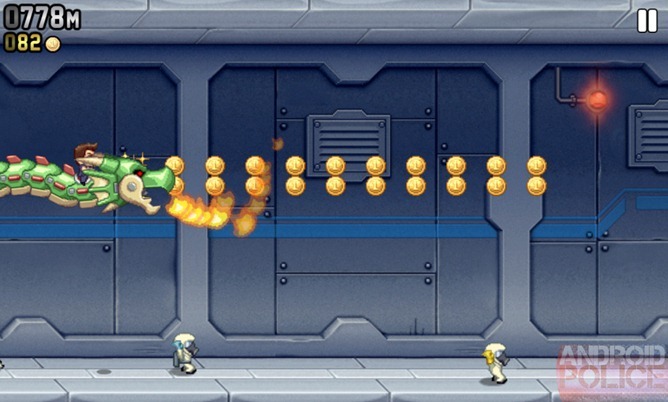 Jetpack Joyride doesn't have levels in the traditional sense - you start the game with Barry busting into the lab, and see how far you can get (and how many slot machine tokens you can grab) before dying. That said, there's a surprising amount of replay value, as the obstacles, coins and powerups will shift each time you play. The slot machine tokens add an element of chance to even the shortest run - there's always a chance that you'll win a "second chance" and be revived, or double your coin haul for the next run, thus adding to that elusive "just one more time" quality that the best casual games possess. 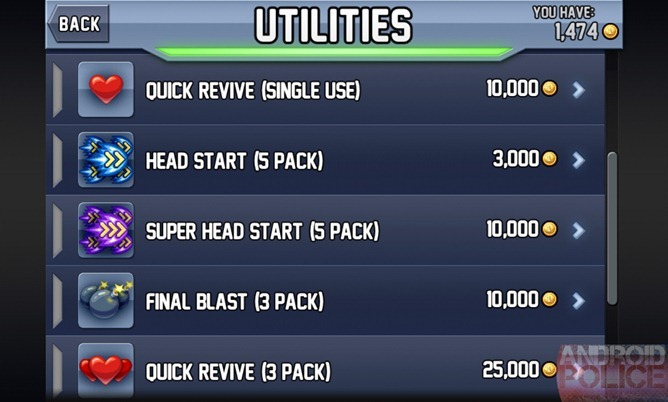 I'm no fan of in-app purchases, even on free games, so when a developer gets it right I have to tip my hat to them. 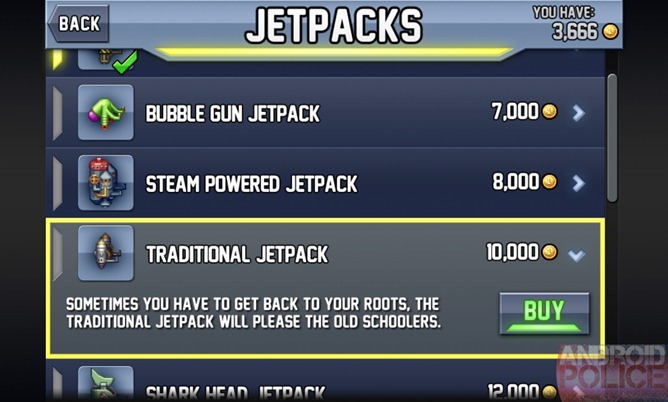 Such is the case with Jetpack Joyride: none of the marginal upgrades or cosmetic changes are impossible to acquire on in-game currency alone, but they're just expensive enough that one might be tempted to send a few real dollars Halfbrick's way in order to speed the process along. 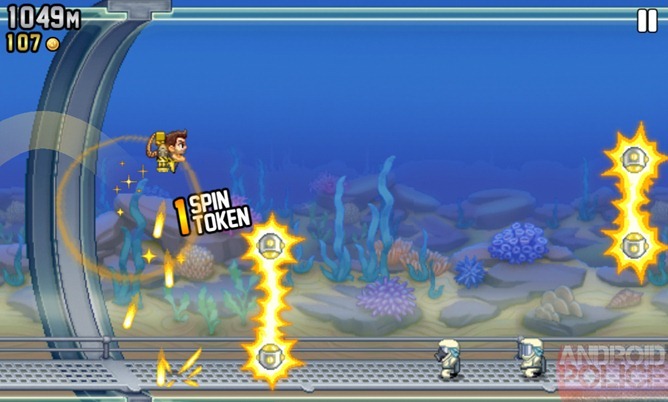 Gadgets augment your abilities slightly, and extra jetpacks add a distinct visual flair to Barry's propulsion (including a Fruit Ninja inspired jetpack and - YES! - a rocket pack that's a dead ringer for Disney's Rocketeer). 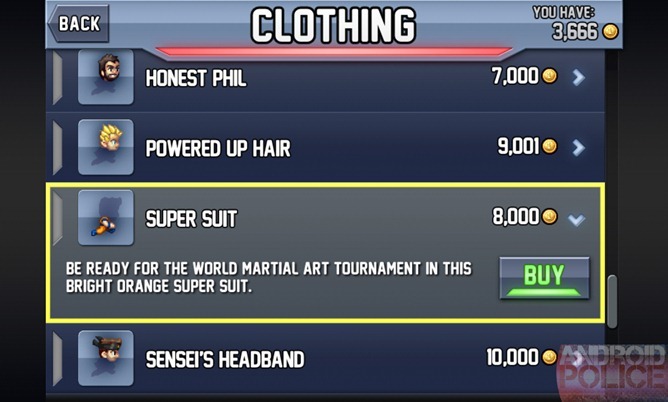 Costumes allow you to adjust Barry's sleeveless sartorial splendor with lab coats, Santa Suits, or even an orange jumpsuit and hair combo that's totally not Super Saiyan Goku. 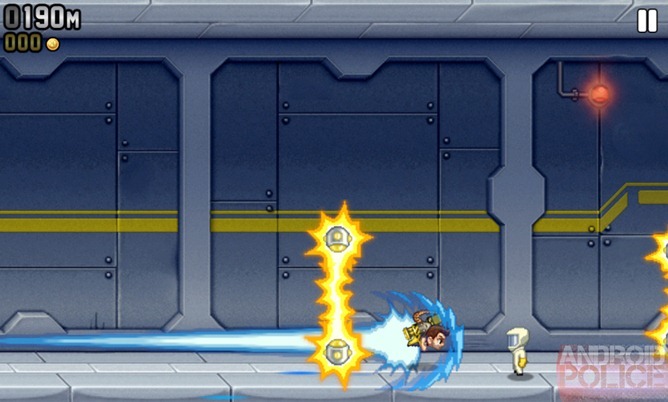 Any game that lets you dress up as Goku with The Rocketeer's jetpack gets extra points in my book. The boys and girls at Halfbrick really know how to craft a sweet-looking 2D game. The colorful sprite-based graphics show homage to the 16-bit era of gaming's past while improving upon it in subtle ways. Barry's animations and his surroundings are fluid and vibrant, and whenever you jump in a vehicle the extra speed and nifty movement is a treat to behold. If you can, keep an eye on the poor scientists as you pass and/or kill them - their terrified reactions are hilarious, in the same vein as Pocket God. All this eye candy is almost enough to make me forget that the user interface, while functional and easy to understand, is clearly copied straight from the iPhone version with no thought given to Android's navigation buttons. Music is pretty standard fare, but this is the kind of game that you'll mostly be playing in silent mode anyway, catching a few runs while in line or on the bus. After a while the constant chinga-chinga-chinga of the machine guns or the bells of the slot machine can get on your nerves. Still, what's there is serviceable, and as always I appreciate the option to turn off the music separately so I can hear the gameplay cues while listening to my own tunes. I don't think I've seen such a perfect balance of simple, addictive gameplay, entertaining visuals and a perfect difficulty ramp since the original Angry Birds. 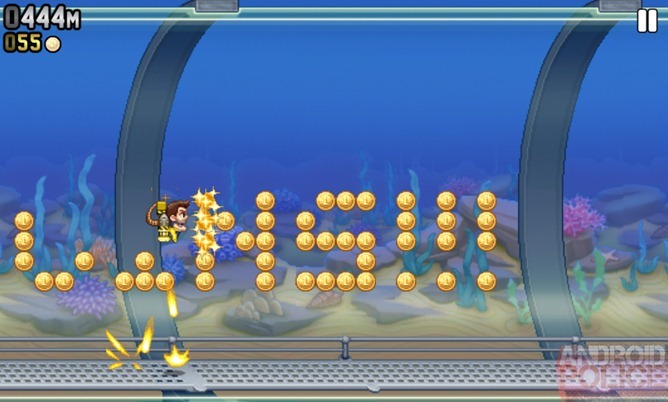 Jetpack Joyride is everything that a casual game should be: easy to learn, difficult to master, charming to watch, and just compelling enough to make you wish you had one more minute in the waiting room to top off that three-kilometer run. It's even got an admirable in-app payment system that lets those willing to pay skip ahead, without denying any of the extra content to those determined to keep their digital wallets closed. 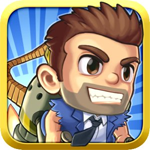 You owe it to yourself to check out Jetpack Joyride - the fact that Amazon's actually paying you a dollar to do so is just icing on the cake.